White Paper: Your PBX Is Killing Your Business | 8x8, Inc.
Get the facts when you download this complimentary paper. Your old PBX has served you well so why switch? After all, changing out your communications system is a big undertaking. However, it may be far riskier to stay with an out-of-date and under-performing onsite PBX. 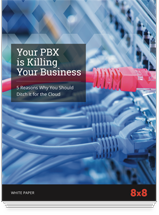 This free white paper Your PBX Is Killing Your Business explains 5 top reasons why businesses are leaving their PBXs behind and moving up to the cloud. Get all the facts when you download this free white paper!